Manet's first known seascape is an imaginative depiction of an American Civil War naval battle fought off the coast of France, near Cherbourg, on June 19, 1864. In the distance, the C.S.S. Alabama, a scourge of Union shipping, sinks by her stern, clouds of smoke arising from a direct hit to her engines by the U.S.S. Kearsarge, which is mostly obscured from view. This picture was first displayed in the window of Alfred Cadart's print shop in Paris in July 1864, demonstrating Manet's quick response to a sensational and recent news event. 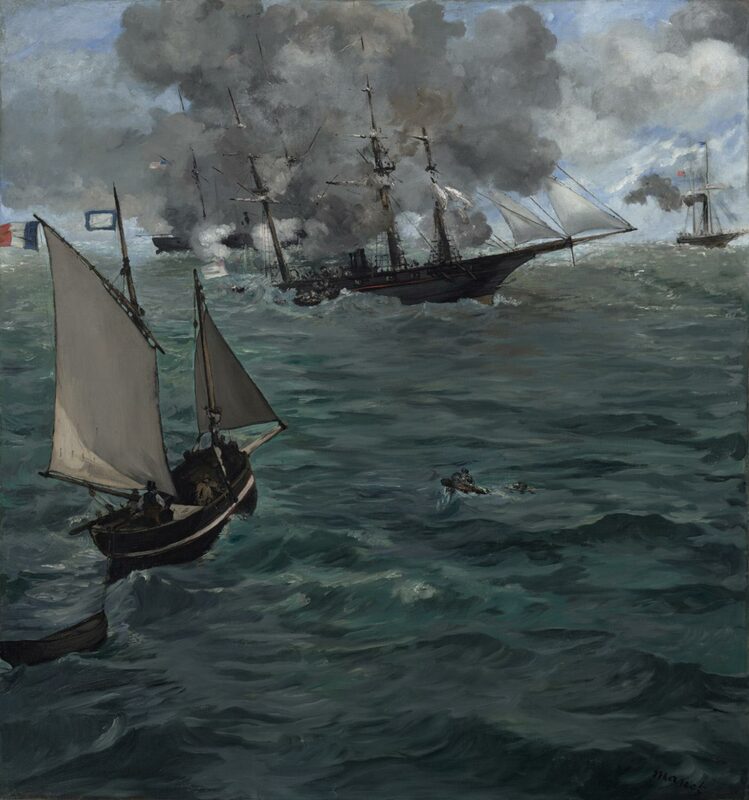 Manet's interests in the sea and in painting subjects from modern life are perfectly joined in this rendering of an important naval battle of the American Civil War that occurred off the French coast. In June 1864, the Alabama, a raider outfitted by the Confederate government, ducked into the harbor at Cherbourg on the north coast of France to release prisoners and take on coal. Eight days later, when she emerged from the harbor, the Union ship the Kearsarge was waiting outside in international waters. The two ships circled one another, firing shots for over an hour until the Alabama was hit and began to sink stern-first. Manet did not witness the engagement but read about it in the newspapers, and a month later he exhibited this picture in the window of a Paris gallery. Three-quarters water, the painting uses a high horizon line and lurching perspective to suggest the chaotic aftermath of the battle. The two protagonists are clustered at the top, enshrouded in a cloud of smoke, while at the center of the picture, a heaving turquoise, blue, and gray sea tosses sailors clinging to wreckage and crashes against a local pilot boat racing to rescue them and others abandoning the sinking Alabama. Jennifer A. Thompson, from Masterpieces from the Philadelphia Museum of Art: Impressionism and Modern Art (2007), p. 50.